Dr Baio runs another successful Golden Gloves Boxing event. 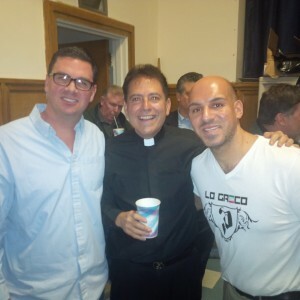 For the last 5 years Dr. Pietro Baio has been the lead chair officer under Msgr Jamie Gigantiello for an annual Golden Gloves Boxing event in the Mill Basin / Bergen Beach area. The event is staffed by members of the local Knights of Columbus, council 14269. Money raises goes toward an annual scholarship program for our local school. Dr. Baio , Msgr Jamie and John Landi taking in the fights . This years event was held on March 12, 2014 and featured some of the best 141, and 178 pounders the New York Daily News Golden Gloves has had in the field. As usual, we had two local pro boxers come and support the event. This year, Sadam Ali, 2008 Olympian with a pro record of 18-0 and Junior ” Sugar Boy” Younan with a pro record of 3-0 were on hand to view the fights. Sugar boy is currently set to get in the ring April 10, 2014 at BB Kings in New York City and Sadam is looking to get back in the ring either April 19 or 26. The event as always was a full house. The local crowd that comes to support this event year in and out is amazing.